Cumbernauld United boss Andy Frame. Cumbernauld United moved up to third in the Championship table with an excellent 2-0 win away to promotion rivals Arthurlie. Andy Frame's side bounced back from the previous week's disappointing home defeat by St Roch's to end the Barrhead side's run of consecutive league victories. 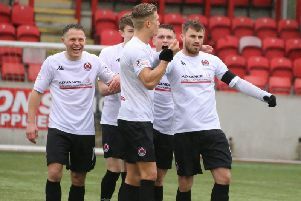 The Cumbernauld men showed their intent from the start at Dunterlie Park and had the ball in the Arthurlie net in the second minute when a Conor Stevenson free-kick caused panic in the home defence and Scott McManus scored but was adjudged to be offside. The visitors were on top and good work from their most recent signing Chris Hall saw the big striker beat two men only to find his final effort being well saved by James Digney in the home goal. In the 19th minute, however, United went ahead. From a Kieran McAleenan corner the ball was played back perfectly by Scott McManus to Paul Callander who fired past Digney. Seconds later a Paddy McCabe pass found McManus in good position but the forward's effort cleared the crossbar. United continued to dominate with every man playing their part but in an Arthurlie foray upfield Hal Bohme brought out a fine save from Cumbernauld keeper Graeme Murphy whose handling through the the match was immaculate. The men from Barrhead enjoyed a better spell and on the half hour mark a near thing at the United goal was fortunately eventually cleared with difficulty. In the 42nd minute, however, Cumbernauld increased their lead with an excellent goal. A wonderful Hall touch saw him tap the ball over the Arthurlie defenders and find Stefan Law who gave Digney no chance with his fierce shot. Arthurlie resumed strongly after the break and Jamie Docherty sent a rocket shot just past. However, the visitors were awarded a penalty when a home defender handled in the box. But Law's spot kick was well saved by Digney and the chance of a three-goal lead was spurned. Arthurlie struck back and a David Reid effort was not far away. Then the same player ran at the United defence to finish with a terrific drive which rattled the bar to be caught on the rebound by Graeme Murphy. It was game on now as the home team endeavoured to pull a goal back to salvage something from the contest but United' s defence was solid and dealt confidently with the Arthurlie attacks. Cumbernauld boss Frame brought on Jamie Kennedy and Alan Benton for the remaining minutes and United comfortably saw out the time to take three valuable league points. The win pushed United up to third, five points behind Rutherglen Glencairn and Benburb, with Arthurlie dropping to fourth.